Never seem to have enough time in the day to get everything done? 'To Do' list getting longer each day? Job, Family or kid's activities take up most of the day? Great for busy people, new moms, birthdays, and get-well gifts for people who are recuperating from surgery, illness or injury, as well as those who are not able to leave their homes, or anyone who just needs more TIME. 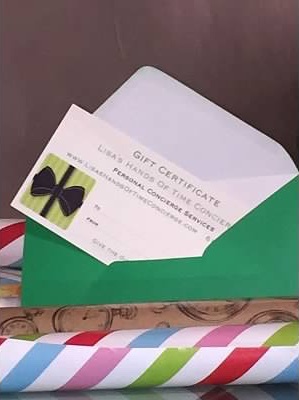 Gift certificates are available in any hourly or monetary amounts. Birthday, Anniversary, Mother’s Day, Father’s Day, Valentine’s Day, Holiday gift packages are available at special discount. Call today – instant PDF or printable certificate available same day! © 2019 Lisa's Hands of Time Concierge, LLC. Bonded and Insured.